This Class III physicians scale with standard size platform, optional height measure and optional Marsden printer is now available with an increased capacity as standard, of 250kg x 100g. Approved 'hold of weight' feature. Weight, Height (manual input) & BMI. Power Supply: Mains/Rechargeable Battery (Charger Supplied). Height and Weight Station with BMI. Fitted with out port for connection to Marsden Micro printer. Portable. Unique hinged weight indicator making storage, portability and operation easy. Protecting the display from damage when not in use. Height, (manual input) and BMI. Auto Hold of Weight Feature. Power supply - Mains/Rechargeable Battery (Charger supplied). IDEAL FOR PROFESSIONAL MEDICAL WEIGHT/OBESITY MONITORING PROGRAMMES. Standard with a printer port to connect to a datac data printer, or connect to a laptop or pc. Very robust and lightweight due to use of aluminium castings. Internal rechargeable battery pack giving a minimum 40 hours continuous weighing. Can also be run from mains using the charger supplied. 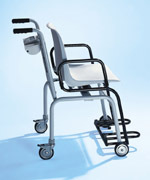 Hinged armrests for easier patient transfer. Hygienic easy to clean seat. Fitted with data out port for connection to Marsden Printer. Light & easy to move. Four castors – two braked. Power supply – mains or rechargeable battery. One piece seat so small children can be seated safely. Fitted with data out port for connection to printer. Standard height for push handles. Safety harness fitted as standard. Approved hold of weight feature. 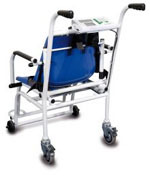 Hinged arm rests for easier patient transfer. Easy to move with four castors (two braked). Power Supply - Mains/Rechargeable Battery. (Charger supplied). Electronic baby scale with digital display and serial interface RS232. CE approval class 3. Electronic baby scales with digital display. CE approval class 3. Portable electronic baby scale with practical handle for convenient transport. CE approval class 3. Mechanical baby scale with sliding weights. CE approval class 3. Electronic column scale with large LC display. BMI function. CE approval class 3. Mechanical person scale with sliding weights. CE approval class 3. Mechanical personal scale with sliding weights. CE approval class 3. Electronic personal scale with remote display on cable. Large LC display and BMI function. CE approval class 3. 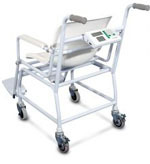 Robust floor scale with automatic tap-on function and large LC display. CE approval class 3. Mechanical floor scale with large dial. CE approval class 3. Large platform scale with BMI and cable remote display. CE approval class 3. 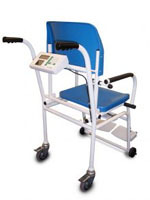 Electronic chair scale with BMI function. Four wheels, Swiveling arm rests and adjustable foot rests. 959 Available with RS232. CE approval class 3. 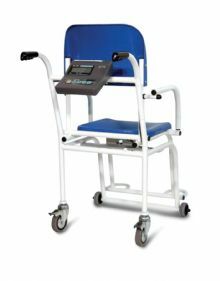 Electronic wheelchair scale with an extremely flat platform and ramp, can be folded up and transported on castors.